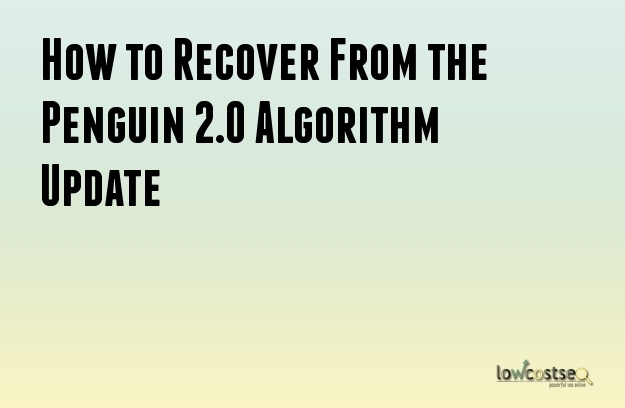 The livelihood of a number of people depends on the variances of the Penguin 2.0 Algorithm. Often, it creates a drastic impact on the individuals than the financial meltdown of 2008. Penguin 2.0 is still quite new. There is a lot left to be learned and changed. However, if there was anything that was learned from Penguin 1.0, it is this that Penguin targets spam content. This comes often in the form of manipulative or unnatural inbound links. Get Hold: Penguin may cause your rankings to tank and it is natural to feel your heart sinking at the prospect. What is more important here is to get a grip on things and hold your head high. A long term approach is crucial to success. One of the main reasons that Penguin can spam your site is because you had used black hat SEO. At times, these methods work but only for a short while. With time, the algorithm catches up and the website goes tanking. If you do not want to resort to desperation, you have received the weapon of having a sound mind which helps you go through any algorithm upset. Remember that when the other sites are giving in to desperation, you need to be steady. It is important to build authority, maintain integrity and establish a reputation in your target niche. It might sound clichéd, but then when you are in the field of SEO, it is best to go slow and steady and win the race. Adopt a Long Time Strategy: If you want the online business to go strong, make sure that it does really well. It is important to do things in the right way. Build a sound strategy that depends on slow gains through the long term and integrates the Google’s Webmaster Rules. Make sure that you are willing to change. The internet changes, and so does the algorithm. Because competitors change, you should too. A part of business in an internet culture is the constant ambience of change. Keep your ear grounded for the forthcoming Penguin, relevance of mobile search, significance of the social signals and more. These aspects affect the bottom line of your business. It is important to adapt accordingly. Send Out Your SEO: Firing your SEO is undoubtedly going to be a difficult step but it might be required by you. Often webmasters claim that their rankings are losing their numbers and they do not know what is wrong. They want to know what is happening but do not have the technical knowhow regarding SEO. They believe that the first SEO firm who comes calling and claiming that they will make the website rank in the first page of Google is actually capable of doing so. You should fire them. You are a businessman after all. Any good SEO firm will document the backlinks that they have created and where they have been placed. If you suspect that your links have been placed in bad locales, ask for a report and start looking elsewhere.